Yes, blogging is still a thing. And it is super-important for businesses that rely on being discovered through Google searches. Sadly, many small business owners don’t appreciate the value of adding a blog to their website. This post explores how savvy companies use blogs to boost online visibility and engage with their target audience. Google would much rather serve up an active website than one that has been gathering cobwebs for 5 years. The problem is, there’s only so much updating you can do to your “About Us” page. A business blog solves that problem. It prevents your site from getting stale and moldy. By providing fresh, indexable content on a monthly (or weekly) basis, Google recognizes your site is active, and bots will return more frequently to index your website. Blogging is a golden opportunity for SEO, don’t miss out! Even if no human being ever reads your article (sad face), each blog post provides indexable content for search engines (happy face). The industry buzzwords you use throughout your article reinforce your standing with Google. As a result, your website is more likely to display in search rankings when potential customers seek your product or service. Be patient, it takes time for blog-writing to work its magic, but you’ll be rewarded when the cumulative effect ultimately boosts your search rankings and improves visitor engagement. Think of blogging like a marketing piece that integrates with your other marketing efforts. It should complement the work you already do with social media, postcards, e-blasts, etc. Taking a strategic approach will amplify your writing efforts. For example, blogging can help your company get discovered via social media. Every time you write a new post, you’re creating content that people (including you) can share on social networks: Twitter, LinkedIn, Facebook, Pinterest. This exposes your business to a new audience that may not know about you yet. By strengthening your social reach with blog content, you can drive new visitors to your website. This creates symbiotic relationship with all your digital marketing efforts. The most effective business blogs anticipate questions that customers might have. Your articles should identify emerging trends and show a genuine enthusiasm for the work you do. By creating helpful and enlightening content, your visitors are more likely to engage with your post. More importantly, you’ll instill a sense of expert authority in the minds of your readers. Sales and support staff can use archived blog posts to bolster their credibility. Effective sales representatives use their library of posts as an educational tool to send to prospective customers. It’s a powerful statement when you can send an informative article over to a perplexed customer. Better yet, if your sales and support staff participate in the writing process, they will gain authority and help share the writing load. Step one: decide on a topic. This can sometimes be the most challenging aspect of writing because you already know everything there is to know about your subject matter. But what would your audience find interesting? Position yourself from a reader’s point of view – someone who has little or no experience in your industry. What are their common questions? After you’ve put yourself in your customer’s shoes, brainstorm 10 topics, pick one, and get started writing. If you’re still stuck, ask your employees for ideas. You’ll be surprised what interesting perspectives your staff may have. Much like a newspaper headline, you want to draw your readers in. Lists are a solid go-to: “Seven Tips to Avoid Failure in Business Blogs”. I also like using parentheses in titles “Blogging for Business (Is Blogging Still a Thing?)”. Don’t be afraid to punch it up with bold language or alliteration: “15 Brilliant Blogs that are Killing it in the Blogosphere”. How Long Should I Make It? Good Question. Yoast suggests a minimum of 350 words for maximum SEO value. However, Google doesn’t place much importance on such a short page. Google prefers to see a web page closer to 2000 words. I try to aim for somewhere in the middle, with 600-1200 words. Be careful with long articles. Readers don’t want to be confronted by a wall of text, so if your article is on the wordy side, be sure to break up your copy into manageable, bite-sized sections. Use headers at the beginning of each new section. Business blogging is a strategic way to reiterate your industry keywords for search engine indexing. A well-written article capitalizes on all the words someone might use when searching for your product or service. I recommend using common phrases instead of industry jargon or acronyms that searchers would not be familiar with. A blog is a great way to incorporate keywords or slang terms that you wouldn’t otherwise put in your main page content. Just be careful not to overdo it, as Google will see right through any attempt to manipulate your ranking by “keyword stuffing”. I aim for a keyword density under 3%. This is easy to calculate using Microsoft Word. Just search for your keyword using the “Find” button or “CTRL + F” shortcut. See how many times your keyword appears and divide by the total number of words. Blogs are a creative excuse to send out links to the rest of your website content. Internal links send a signal to Google that there is important content elsewhere on your website. But go easy, you don’t need dozens of backlinks. I recommend a maximum of 3 internal links (to other pages on your website) and 3 external links (to pages outside your website). That is, after all, why it is called the “world wide web”. If real people are reading your article (and not just Google bots), be sure to include compelling “Calls-To-Action” throughout your copy. A call-to-action is any device that encourages your readers to do something. It could be as simple as a phone number or e-mail address. An enticing offer could persuade visitors to fill out a form, subscribe to a newsletter, or sign up for a trial. Give your readers a reason to interact with you. While strong content is critical, consider giving your blog an extra boost with an eye-catching visual, like a photo or illustration. People will be more inclined to continue reading if you draw them in with a fun, colourful graphic. Just be careful clipping images from the web, due to copyright infringement. There are several good-quality sites for sourcing royalty-free images such as: UnSplash or Pexels. Better yet, use your own photography if you can. 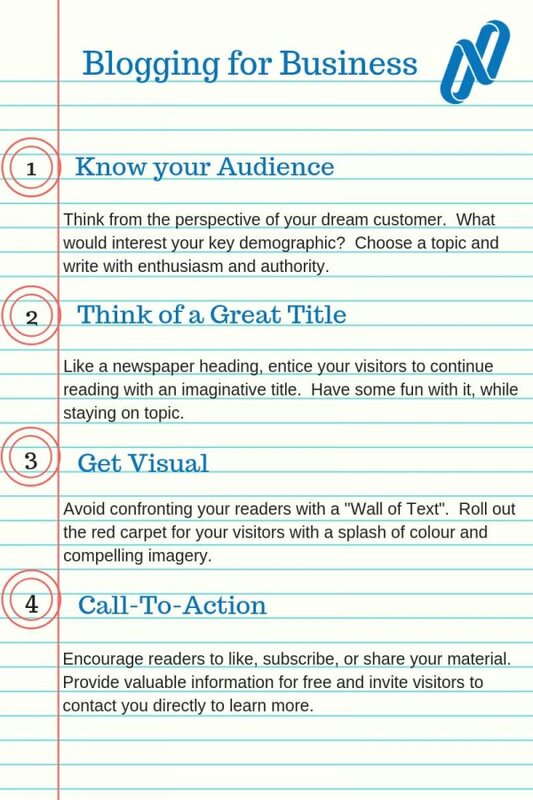 If you are feeling creative, make an infographic that compliments your article. If you are new to the design world, Canva is a fun place to start. Instead of quietly posting your news article and hoping that someone stumbles across it, use the opportunity to shout about it. Create social media posts, on Facebook and Twitter, letting the world know you published an awesome article. Since your website homepage is likely to be your most-visited page, then set up a section that automatically populates your most recent articles, so your visitors can see what you’ve been up to. What if writing isn’t your strong suit? Or you’re too busy running your business? Whatever happens, don’t let your website atrophy. Your overall web presence is too important to let it whither on the vine. If you don’t have someone on your team that is able to produce quality content, then consider outsourcing this task to a digital marketing agency, like NetGain. By hiring a marketing firm, you leverage the talent of professional copywriters. Beyond words on a page, a digital marketing agency provides big picture thinking. Articles will be written for maximum SEO value. After publication, they will measure traffic to your blog and use this data to refine subject matter and writing style. An agency can also promote your blog with the goal of driving traffic to your site. Outsourcing improves consistency in several ways. Firstly, you achieve publication consistency. You can count on new content to appear on your website on a regular schedule, whether it is every month, or every week. Google likes seeing a regular infusion of content into your website. Secondly, you can count on copywriting consistency. Chances are, your content will be written, or at least proofread, by the same person at the agency. This way, you achieve continuity in writing style from one piece to the next. When selecting a copywriting service, do your research. Check out their own blog section. Better yet, ask for samples of work they have published online and evaluate their writing style. Is the content thoughtfully-written, researched and consistent? Is there an accompanying visual or graphic? Are their articles long enough? Have they used calls-to-action? Are there internal links? Do they write the articles in-house or do they offshore the task to cheap labour in other countries? We’ve heard a lot of (often amusing) stories of businesses that have experimented with discount blog-writing service and gotten exactly what they paid for. If you’re still unsure how an agency can help improve your business blogging efforts, visit our content marketing web page. Here you’ll get a better idea how we work with clients to improve results through business blogs and other avenues of digital marketing content. Do you need help kick-starting your business blog? NetGain’s content marketing experts deliver compelling industry content. You can count on NetGain’s quality copywriting service. We’ll publish your article directly to your site and be sure to follow the best practices outlined in this article. If you’re wondering how to get started, contact our Barrie office today (705) 797-2455. We would love to learn more about your business and strategize the best way to drive traffic to your website and convert visitors into customers.